“You will lose some games when you don’t deserve to and you will win some you perhaps don’t, and I am flabbergasted at today’s result because we were so dominant. “I thought we played some really good stuff and had numerous chances on their goal. We had a goal that was disallowed in dubious circumstances after their players complained and you’ve got to take that on the chin sometimes. “I think in the last 10 games, there has only been one really poor performance and that was Burton on Boxing Day. There won’t be many teams who had to travel as far as us in the last few days and that will have taken its toll a little bit, but performances like that (vs Scunthorpe) I will put my name to. “Results will go one way or the other and if I start panicking after a performance like that then we would be in trouble. Against Coventry I will ask for the same performance please; with plenty of shots on their goal and maybe just one will sneak in and we’ll win the game. 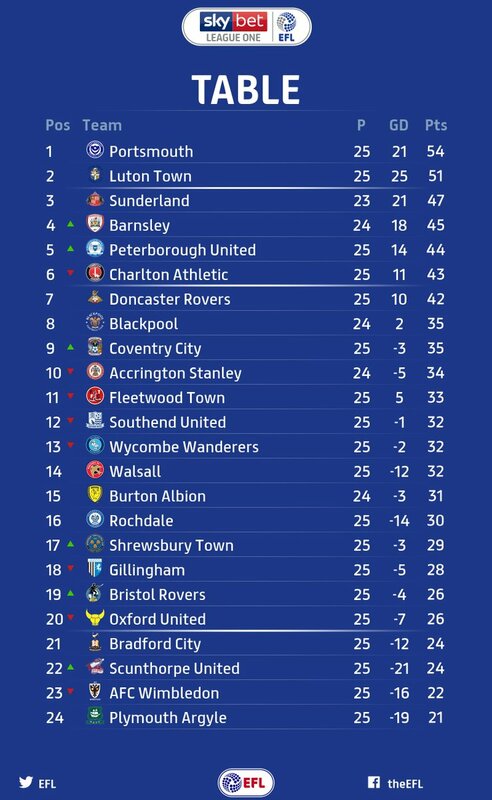 Wanderers down to 13th after a third successive defeat. A frustrating day in North Lincolnshire.